For applications that require tungsten to be gold plated, Luma metal offers gold plated tungsten wire in highest quality. Plating is providing oxidation resistance and improved wettability for soldering. Standard gold plated thickness for wires < 50 microns (0.0097″) is 3-5% by weight. For wire dimensions > 50 microns the coat thickness is 0,5 micron. Upon request we also manufacture gold plated tungsten wire with non-standard coat thickness. Tungsten and gold are almost equal in density. Consequently gold plated wire will not change in density compared to unplated wire with same diameter. The electrical resistance of plated tungsten will be somewhat reduced because of the lower resistivity for gold. Gold plated wire is very suitable for use in harsh environments. However the melting point for gold is 1064°C in comparison with 3410°C for tungsten wire and this should be considered when using plated wire. We are constantly developing our plating technology and we also design our own plating equipment. This allows us to meet our customers demand for a well adhesive and dense gold plated wire with a uniform thickness. 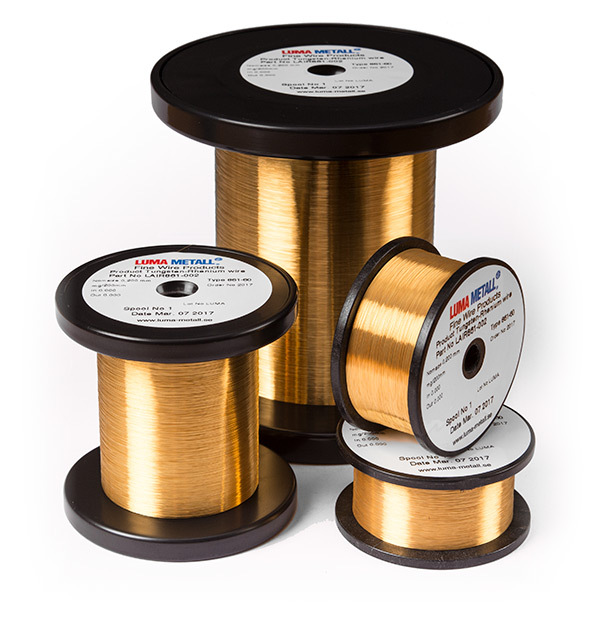 With our leading technology for plated wire we got all possibilities to create great gold plated tungsten wire. Our modern scanning electron microscope is an example of an instrument that allows us to confirm the continuous improvements of our manufacturing technologies. This is resulting in an improved quality for our plated wire. Luma gold plated tungsten wire is available in the dimension range 0.005 – 0.2 mm (0.0002 – 0.00787″). Luma supplies wire to medical industries all over the world. Medical applications are ruled by strict specifications and rules to ensure the safety of patients and medical staff. Most of the Luma wire supplied to the medical industry is Gold plated tungsten wire. One major reason for using tungsten wire in medical applications is the strength and durability. This makes it possible to use very fine dimensions, still trusting the wire to cope with high load. Also, tungsten wire has a very high density, 19.3 g/cm3, which make it highly visible on x-ray.